Sometimes it’s easy to forget the true origins of a holiday. Memorial Day in the U.S. may be one of the most glaring examples of this. A date set aside to remember men and women who have died in military service has become more synonymous with work vacations, barbecues, and vists to the beach. The National Moment of Remembrance resolution, passed by Congress in December 2000, is along the lines of how the holiday really should be observed. It encourages every American to pause at 3:00 p.m. and observe a moment of silence in honor of the fallen. Given the central role electronic communication plays in the lives of Americans, especially American youth, abstaining from it for even a moment constitutes a very real sacrifice. 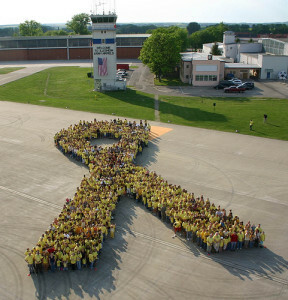 At 6:00pm EST (18:00, when “Taps” is played at the end of the military day) we could have Americans across all time zones make a final tweet or status update, reading simply ‘Remembering Memorial Day,’ perhaps accompanied by a yellow-hued avatar to drive the point home. Those with a specific person to memorialize would follow the word ‘remembering’ with the name of their fallen friend or relative. Twitter and Facebook users could leave this statement just before going silent, so their friends’ screens are filled with multiple iterations of this simple message. So, on that note, we will not be blogging or tweeting any further today. Image from the United States Army on Flickr, used under its Creative Commons license.